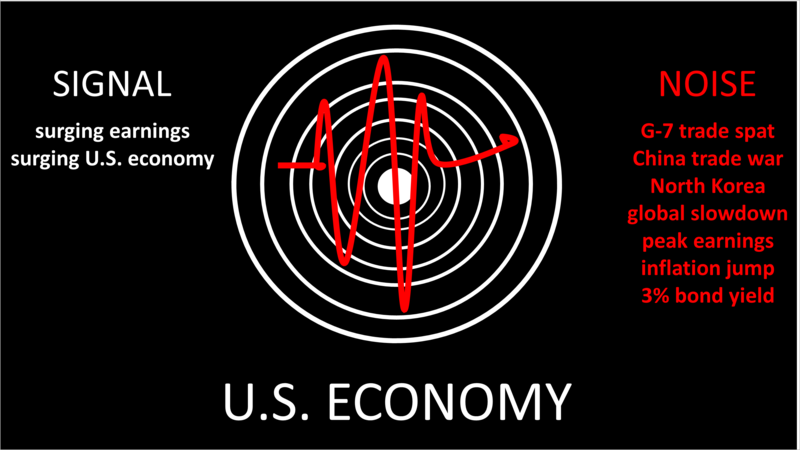 The signal to noise ratio in the U.S. economy is blaringly anomalous. The strength of economic signals is about as strong as ever, amid a noise level that seems extraordinary in post-War history. The distractions come in waves: A trade spat broke out between the U.S. and its allies at the end of the annual G-7 summit. Meanwhile, President Trump upped the ante in a trade skirmish with China by adding tariffs on $50 billion of imports from China, and worries about a global slowdown escalated as tough trade talk spread. In addition, President Trump talked face to face with the leader of North Korea, and Trump had kind words for the dictator after their meeting and declared that the Asia nuclear crisis had been defused. Was it? With inflation jumping last month amid heightened fear that hitting the 3% yield on the 10-year U.S. Treasury bond prefaces an era of rising interest rates and inflation pressure that will quash future growth and cause a recession. Will the decibel-raising discordance drown out signals screaming strength? Each of the of the blue lines represent Wall Street analyst forecasts for earnings on America's largest 500 publicly-held companies for a calendar-year, starting with 2011. Markedly different from the seven initial years shown are the earnings forecasts for 2018 and 2019. This shows just how explosive earnings are expected to grow compared to the norm. The blue line in the lower left represents earnings forecasts made by Wall Street analysts for 2011. 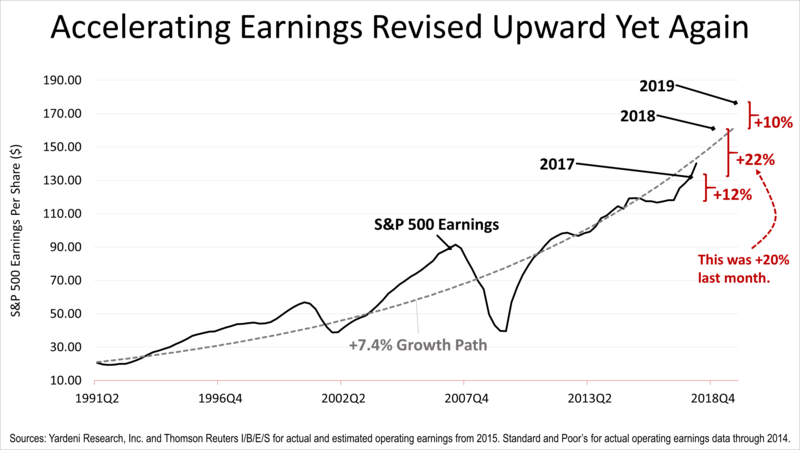 Analysts started releasing earnings forecasts for 2011 in mid-2009, raising expectations through mid-2011, and then dropping off. That pattern of lowering earnings forecasts as the year comes closer to an end is normal. Analysts are known to start out optimistic about the companies they research. However, as the end of the year draws closer, analysts become more realistic and lower their expectations. That is not what has happened so far in 2018. 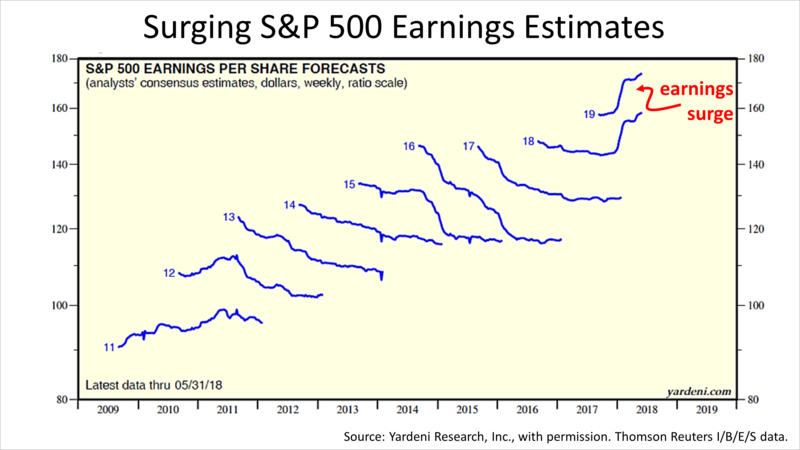 Earnings estimates have soared, counter to their historical pattern as analysts have continued to improve earnings forecasts, even as the end of 2018 draws near. The momentum of the earnings surge was visible in recent weeks. In early May, analysts had been forecasting 18% growth in earnings for 2018. In early June, analysts raised their expectations to 22%. That's a 20% surge in their forecasts for corporate profits in a single month! A 22% earnings growth rate would be about three times the norm. For context, the S&P 500's historic compound annual earnings growth rate is 7.4%. Another strong signal is business optimism. 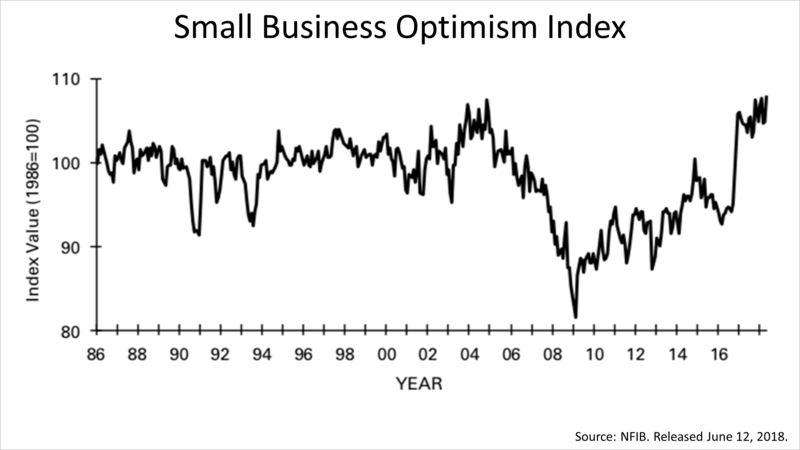 In May, the small business optimism index tracked monthly by the National Federation of Independent Business surged to its second-highest level in its 45-year history. Small businesses play a major role in the American economy, employing about half of private-sector employees and generating about 70% of net new jobs annually over the last decade. 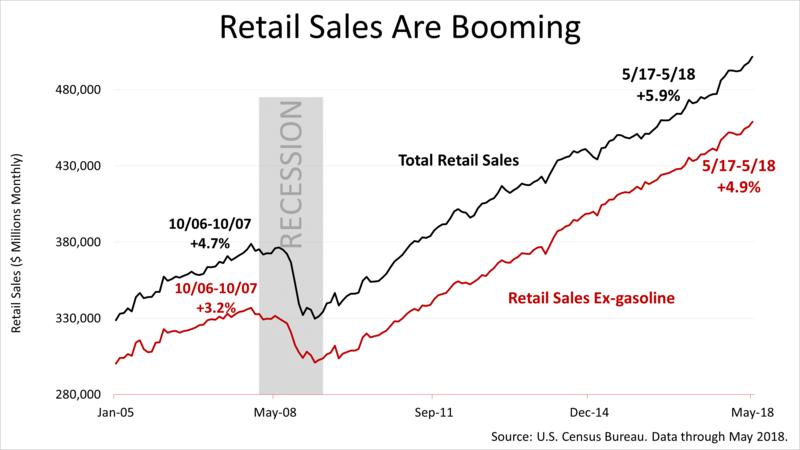 For the 12 months through May, retail sales were up 4.9% - significantly higher than the 3.2% peak reached in the last economic expansion. That's booming consumer activity and consumers are about 70% of U.S. economic activity. 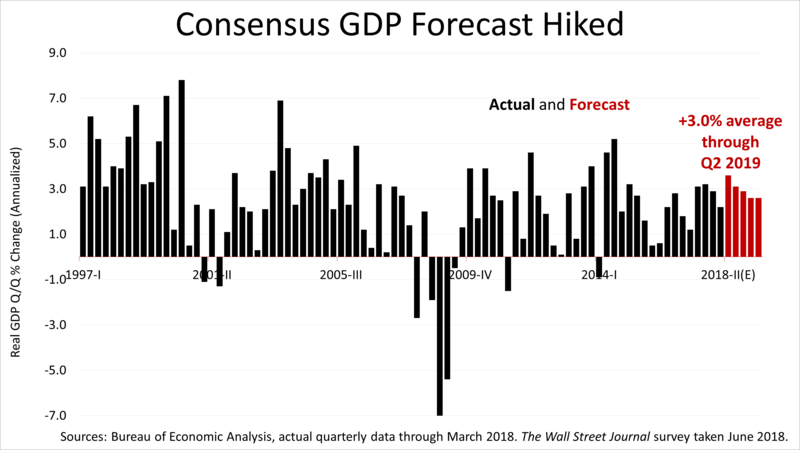 For the quarter ending June 30, the 56 economists surveyed by The Wall Street Journal in early June forecast a 3.6% growth rate and an average 3.0% rate of quarterly GDP growth through June 30, 2019. 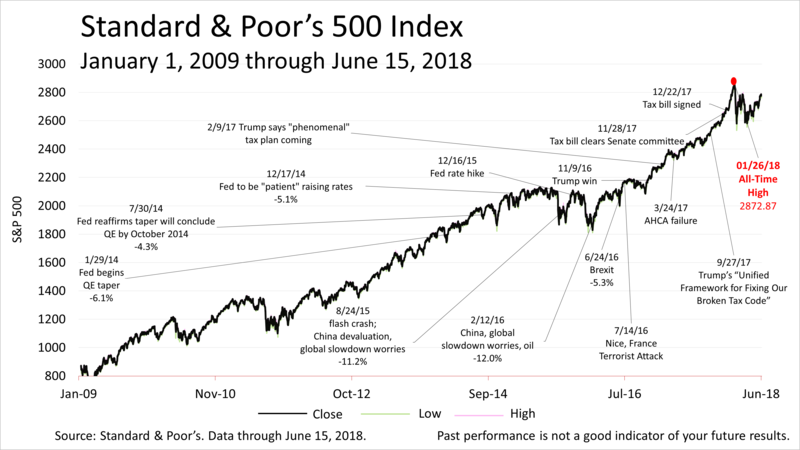 The S&P 500 closed at 2779.66 on Friday, not far from its all-time high and it was unmoved by last week's voluminous distractions. The economic signals are screaming strength currently and there is certainly no sign of a recession ahead. However, the noise could suddenly roar and cause a decline of 10% or 15% in stock prices at any time. 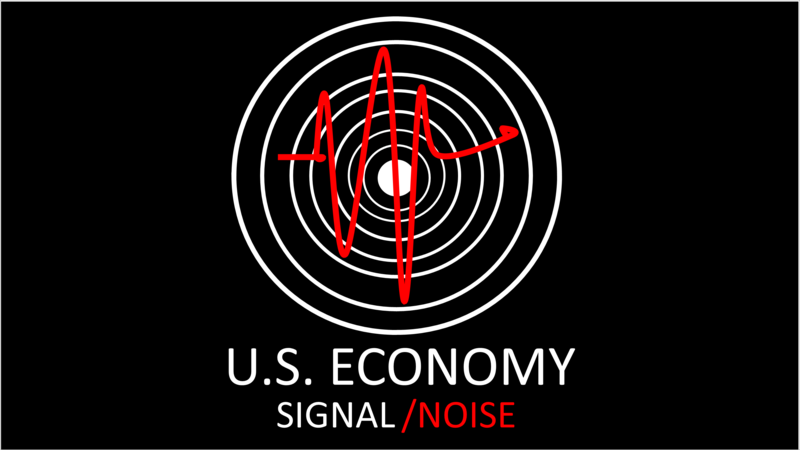 We're here to keep you tuned in to the economic signals and filter out the noise. Note: 2017, 2018 (estimated) and 2019 (estimated) bottom-up S&P 500 operating earnings per share as of June 4, 2018: for 2017, $131.98; for 2018(e), $160.09; for 2019(e), $176.53.